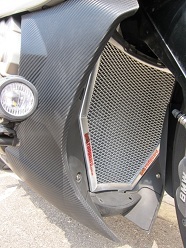 Ordered the radiator guards for my BMW R 1250 GSA and received them the following day. They fit perfect and it took less then 10 minutes to install them. The guards are solid and so much better then the other ones I have seen on the market. Most are made of a thin sheet of metal that you have fit with extra cable ties and foam tape to avoid rattling. For this competitive price they are absolute the best on the market. And they look really great! The RADGUARD is superbly made and fits like a glove, it will withstand anything thrown up from the wheel. 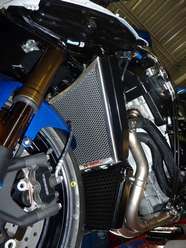 We love the Radguard, it is being used on Moto Genie's 2012 ZX10R racing in the British Superstock Championship. Fit and build is superb and it looks the works too! Will recommend you to anyone who’ll listen and look into my own radiator guard needs in the not to distant future. Got my gear today lads , fitted it straight up.Fitted like a glove.Thanks for the stubby holder as well.Will buy from you people more often. 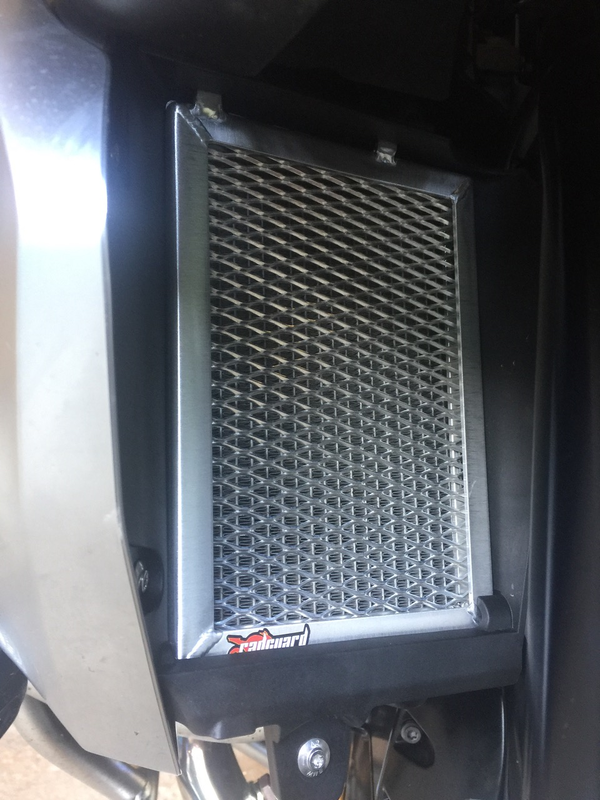 Very easy to install in less than an hour for both radiator & oil cooler guards, I am very satisfied with the result. Thank you very much for the advice on YOU TUBe. Just a quick email, Fitted radguard on the weekend, all good perfect fit and great instructions. Congrates on running such an efficient business you make a world class product second to none. From website navigation to speed of delivery and quality of the product. Hi, The new RadGuard arrived last Thursday and I fitted it on the weekend. Perfect fit and looks great. Good clearance on forks and fan. Have been recommending you to all my mates so hopefully some more sales are coming your way. The guard for my ST was delivered promptly, fits perfectly and has been greatly admired using the stubbie holder provided! I would have to tell someone about the fitment before anyone would actually notice so that is great. Nice work. Thanks for the prompt delivery of the radguard for my M109R and enclosed stubbie cooler (a nice suprise). The radguard fitted perfectly and easily with no drama and looks good on the bike. Have had people ask about it since fitting it. 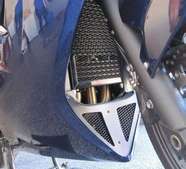 I have one fitted to my GSXR but it isn't as obvious to people as the one fitted to the M109R. Again thank you for the prompt service. Fitted the radiator guard to thye Sprint GT today. Everything went well as per instructions even with one index finger out of action. Everything fitted well. The fit is perfect - thanks. Guards arrived and are now fitted up. Thanks for the quick service you provided and the freebies. Greetings from Penang, Malaysia. Just a short TQ note; I have received my Radguard package yesterday (M'sia Wednesday) for my KTM 990 SMT. Your instruction is simple to follow and fitting was easily done in no time. Appreciate the cup warmer and free magazine. First thing I put on all my bikes is a Radguard. Out of the 25 high speed tourers in my group 95% use Radguard. They are tough and never need looking at after fixing. Great Aussie product! Thanks for the guard, nice tight fit and the beer holder rocks, will recommend rad guard to everybody thanks. Kevin Arnott. I just wanted to drop a line to express my thanks for your really prompt service and outstanding product. The Guard I ordered for the Yamaha FZ6S arrived today and was easily installed in a matter of minutes thanks to your brilliant engineering design and very clear instructions that came with the product. On reflection it took me longer to get it out of the box than it did to install. 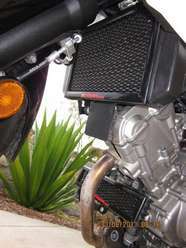 Late last week I also installed one of your guards on my new GSX1250FA. I had ordered this through the dealer who sold me the bike. Once again, fitting was made very easy due to exacting engineering and very clear illustrations/instructions. This installation took some time due to the more complicated structure of the bike and fairing but was never hindered by any issues with your product. Three years ago I fitted my first Radguard to a GSX650F and had over 53000km of good service and protection over some very ordinary Australians roads. I must admit to one time trying a competitors product for my wife's GS500F and was not impressed to discover it was mounted with cable ties instead of solid hardware. We won't be going there again. I'd just like to say my thanks for such fast service. I was genuinely surprise at how fast my package arrived and greatly appreciate the little extras too! Aside from the service, your products are of high quality and fit perfectly! Just to let you know the RadGuard for my Suzuki GSXR 750 K9 arrived at 10.30 am Monday 22nd August, excellent delivery service from yourselves to the U.K. It was well packaged and was fitted to my bike by 11.15 am ! 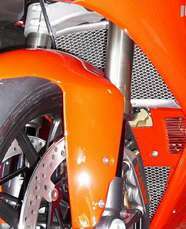 - this was all thanks to the excellent instructions and the precise fitment of the Guard for my particular bike. Exemplary service from RadGuard Australia throughout, from the initial purchase to making sure the correct Guard for my year and model was dispatched and then the e mails letting me know the process of the order. 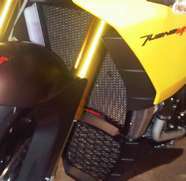 I have attached some photo’s of your product on the new Aprilia Tuono 2011. Fitted perfectly, clear instructions and it also looks great. Recived the Radguard for my 09 R1, fits like a Glove, looks great. Your attention to my order and delivery were second to none. P.S The stubby holder that came with the guard was used whilst I fitted the guard, it was so quick the guard was on before the stubby was finished! 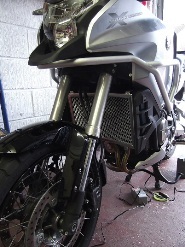 The new build up of the F800 GS is coming together nicely and we are gearing up for a Spring tour very soon. I was just wanting to touch base with you to find out if the RadGuard has left port yet or when I could be expecting it? I’m sure you see heaps of pics of bikes with the Radguard equipment on-board. I too like seeing other peoples creations and how they might put their own spin on the norm. So here are two of my bikes both with Rad guards. 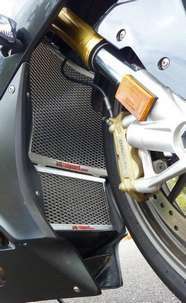 Yesterday we received our order from you for a set of Suzuki GSX-R 1000 guards. Just a quick note to say thank you for your prompt attention and delivery. 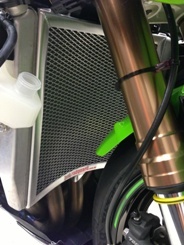 We are very pleased with the radiator and oil cooler guard. They look great. Thanks for the prompt delivery, nice touch inc a couple of Cycle Torques and a stubbie cooler. I fitted the guard in 10min so it was a great result. Thanks very much. Just received the item today. Thanks again for the expedited shipping, good looking product and appreciate the magazine and coozy. 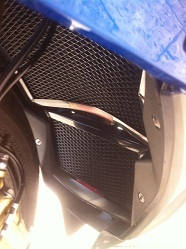 Thanks for my radiator guard arrived today for my Suzuki Gladius. I had it fitted in 10 minutes, so easy. It fitted perfectly and looks part of the bike. An exceptionally well made addition and so professionally made. Would highly recommend this product. I have nothing to complain about! :) The radiator guard is great, well packed and I love the beer cooler (using it now). I just wanted to let you know that i'm very happy with the product, and your service. Much appreciated. 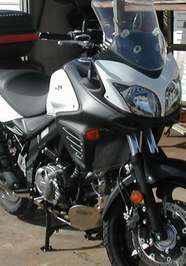 I'll certainly recommend you to my riding buddies. Regards, Michael La Roche. Thanks for providing an excellent product. Quality and fit are superb for the trusty 09 fireblade, cant believe it took me this long to purchase one of your radiator guards, more Rad Guard gear to follow plus talking you guys up next ride and the incredibly fast service.